With more and more people using our bestselling WooCommerce table plugin, we’re enjoying seeing all the innovate uses that people are finding for it. Here are 3 very different examples of how real customers are using the WooCommerce Product Table WordPress plugin. 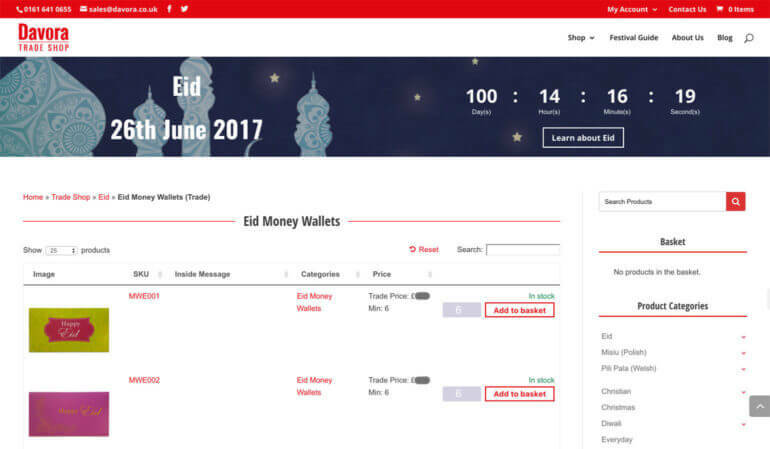 The first example uses it as a WooCommerce wholesale plugin, with the table view only available to approved trade users. The second example adds WooCommerce tables to the single product page. The table lists kitchen parts, letting customers mix and match to order a complete kitchen. The final example uses WooCommerce tables to create a music store, with embedded audio samples to listen to before buying the music online. Learn how to improve your WooCommerce conversion rate with WooCommerce Product Table. Davora are an e-commerce website selling ethnic and minor season greetings cards. As well as their public WooCommerce store, they use Wholesale Suite’s ‘Wholesale Pricing’ plugin to display wholesale prices in a separate trade area. This lets them control how products are sold to wholesale users, for example with separate trade pricing and minimum order quantities. When you log into the trade store, you can navigate to a product category. The products in each category are listed in a searchable, sortable table created using WooCommerce Product Table. 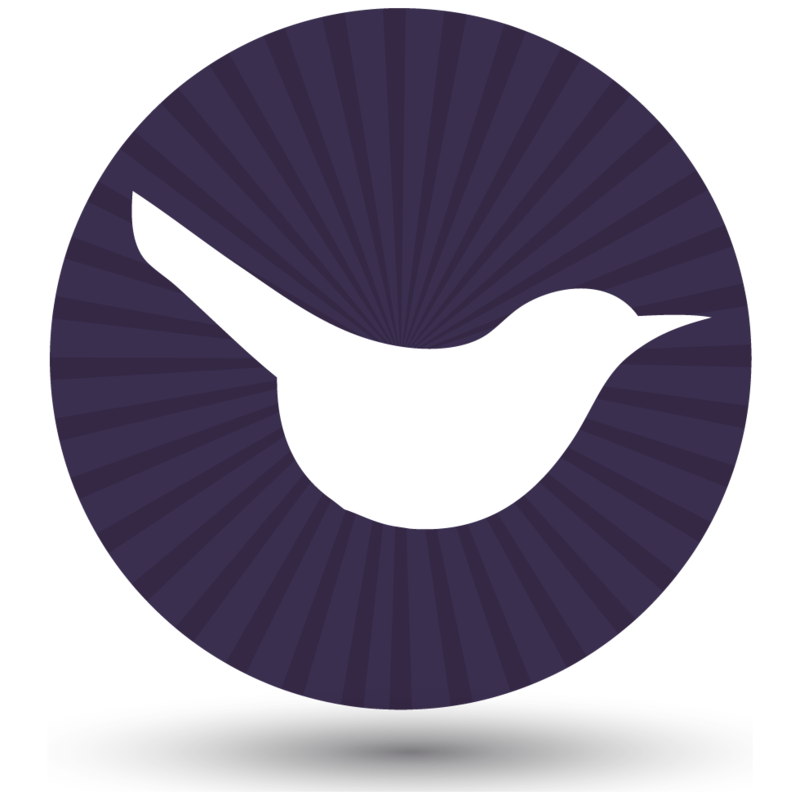 WooCommerce Product Table is fully compatible with Wholesale Suite’s pricing plugin so they can be used together. It’s very similar to the advice in our tutorial on how to create a WooCommerce order form. 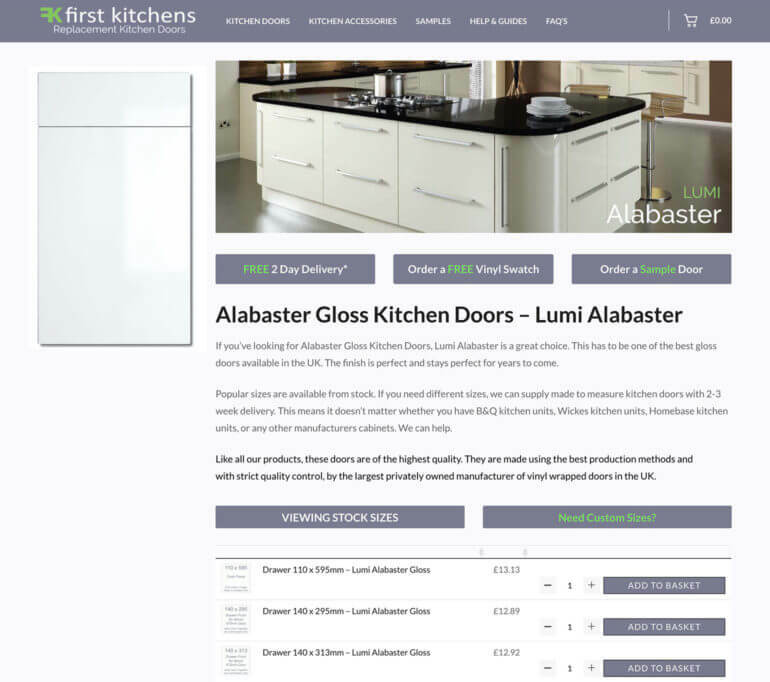 First Kitchens have a beautiful WordPress website with WooCommerce tables within the main description on the individual product pages. They use the tables to list the available add-ons for their kitchen parts. A product list offers a more structured way to display extra product options than using variable products or the official Product Add-Ons extension. Until we saw the First Kitchens website, it hadn’t occurred to us that anyone would ever add a product table to the single product page! After all, most WooCommerce sites only list 1 product on the individual product page! However when we saw the tables in action, we saw that it makes perfect sense and is an ideal way to sell kitchens online. A classic example of how people are using the WooCommerce table plugin in innovative new ways! 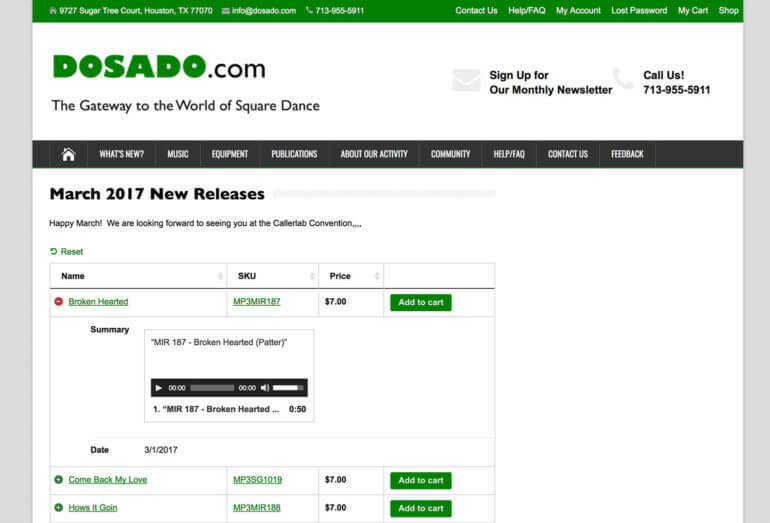 Dosado are a square dance website with a WooCommerce music store where fans can buy their music. They use our WooCommerce table plugin to list their music products in a responsive jQuery table. The table has columns for name, SKY, price and add to cart. They have cleverly adjusted the column widths to add an expandable cross. This can be clicked on to expand the table to reveal 2 hidden columns. These contain the date and include an embedded audio file so that you can listen to a sample of the music before buying. Dosado have multiple WooCommerce tables on their site. There’s a separate table of products for each month, and also on other locations around the site. This has allowed them to create an entire WooCommerce website without any of the standard built-in category layouts. The result is much better suited to a music store. Audio samples are an excellent way for music stores to improve conversion rates and increase sales. Dosado have achieved this in a subtle way that doesn’t take up too much vertical space, while providing plenty of useful information in the WooCommerce table. Get WooCommerce Product Table for your own website. Use the knowledge base to find your own innovative ways to use it. Become an affiliate and earn 30% commission for recommending our plugins. Already using our WooCommerce table plugin, or something similar? Add a link to your own website in the comments below. We’d love to see how you’re using tables in WooCommerce!